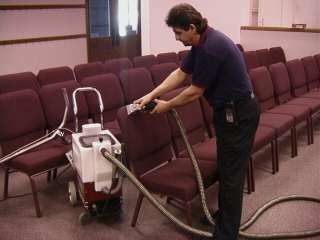 Extraction System used on upholstery. There are many reasons your valuable possessions can become soiled and therefore many reasons to have them cleaned properly. When you call Exact Extraction you can be sure that the job will be done correctly and economically. It is preferable to have all breakable items removed from the areas being cleaned. Table lamps should also be removed. Couches and chairs can be moved with in the area being cleaned and we provide Styrofoam blocks or plastic squares to be place underneath these items. While the cleaning process is not harmful to pets, it would be advisable to keep pets out of the cleaning area during service to prevent scaring the pet, or the operator!